Bolton’s Amir Khan 31-4 (19), who faces Canada’s Phil Lo Greco 28-3 (15) at Echo Arena in Liverpool this Saturday night, insists that any future fight between himself and local rival Kell Brook 37-2 (26) will have to take place at welterweight. Brook’s last fight was at junior middleweight after facing Errol Spence Jr for the IBF welterweight title in May 2017. At 31-years-old all indications are that the 5-foot-9 Brook has outgrown 147-pound weight class, but Khan is having none of it. Former junior middleweight world title challenger Ryan Rhodes says he can’t see Brook returning to welterweight, but a catch-weight bout might get the fight over the line. “I would like to have seen Kell have another fight at light middleweight. But that doesn’t look like it’s going to be just yet,” said Rhodes. 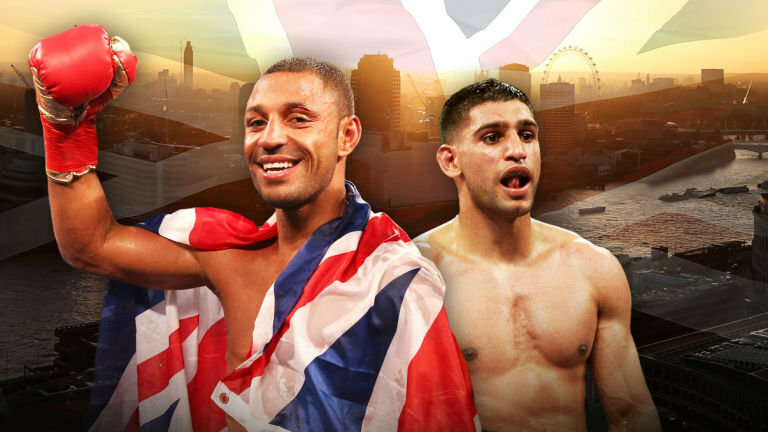 “Khan doesn’t want Kell at light middle, saying it has to happen at welterweight. Kell can’t make welterweight…Khan knows that. “If they can agree a catch-weight, 10 stone 10 or 11lbs…there is not another fight out there where they are going to generate that much interest, that much money, that much publicity. Former IBF light heavyweight champion Clinton Woods is confident that fight will happen. “It is going to happen,” insisted Woods. “It should have happened two years ago when Kell was unbeaten but it is still going to be a sell-out.